The “Lomax” books by Preston Lewis are funny and enjoyable. This was a fun little romp. I can’t say I liked the narrator—or any of the characters, really—but it was a story about a violent, terrible time, and goodness, it was well-written (and well-researched). And it had a great ending. Just sayin’. I’m one of those people that didn’t expect a lot out of this book. Was I ever pleasantly surprised! Very personable story telling (and I don’t for a minute buy into some fellow named Lomax having all these papers from which the writer drew from ever existed…in fact, I don’t know if the writer actually existed!) No matter! One still gets a fictitious, though always amusing, romp through Lincoln County and some of its residents such as Billy the Kid, of course. This book had me laughing out loud. I kid you not. To me it was actually up on the same level of Larry McMurtry’s comical and tragic writings about the west. Yes, I would mention Lonesome Dove and many other of McMurtry’s books. If you like McMurtry, you’ll like this. If you haven’t read McMurtry, then I’d say read him too and particularly his westerns! This was a fun read! I liked this book almost as much as I did The Redemption of Jesse James. Again written from the viewpoint of H.H. Lomax this book fills all the requirements of a western i.e., cattle rustling, damsels in distress, and sixguns; however it seems to be much more. The characters are very vibrant and inline with the time period. This book happens when Lomax is a bit older and has lost some of his wide-eyed innocence, but he still has some of his back-woods ways and his wry humor. Overall it’s a great story to read, anytime. I haven’t finished this book yet, but am about 2/3 done. I didn’t want to read it, but found nothing else around. I can hardly put it down! It tells the story of the Lincoln County War so convincingly from the viewpoint of H.H. Lomax, that I was driven to the internet to learn more about the actual events. The writing is very descriptive and entertaining. I wish I’d read this before we went through Lincoln Co., I’d have paid closer attention. After reading one of Mr. Lewis’s books I found it to be wonderful. If the West was anywhere near what he writes, life was an adventure. I have his whole collection. It’s a tour-de-force, a marvelous amalgam of just enough fact and exactly the right amount of fiction. A comic novel loosely based on the memoirs of H.H. 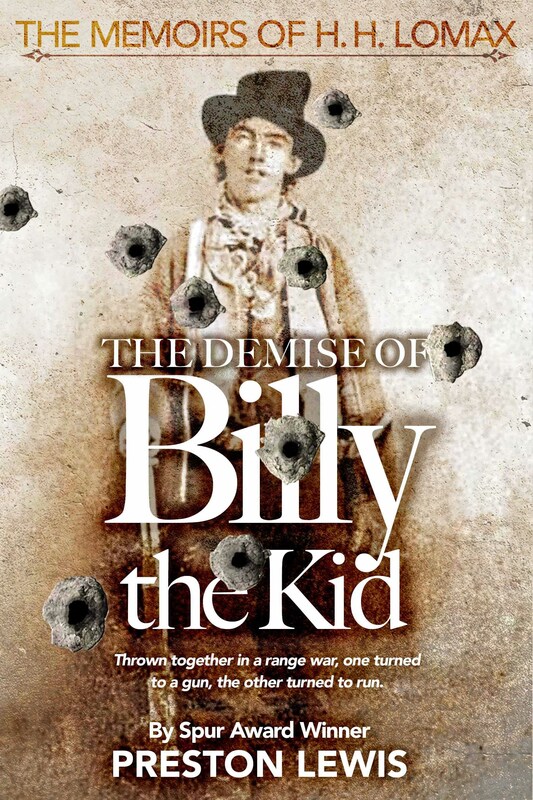 Lomax, The Demise of Billy the Kid is an absolute delight. Lewis finally gives free rein to his gift for humorous narrative to re-create Lomax’s adventures during the Lincoln County War … H.H. Lomax is one of those wonderful characters, who, if he didn’t exist, a writer would have to invent. Fortunately, Preston Lewis did. Or did he? Vivid characters, historically accurate detail, humor, and superb writing make this novel the most entertaining read of this or the past several years. Meet H.H.Lomax, who will meander on his mule Flash through some of the West’s most fabled events, starting in this book with the Lincoln County War … Written with verve, intelligence, humor and sound research. A new series by Preston Lewis features a protagonist, H.H. Lomax, who isn’t much of a gunfighter, horseman or gambler. Instead, he is a likable loser who runs into old western celebrities like Billy the Kid and the Jesse James gang, and barely escapes. Now, Preston Lewis … is doing with the ‘papers’ of H.H. Lomax what such illustrious predecessors as A. Conan Doyle and George MacDonald Fraser did with those of Holmes and Flashman—bring these hidden memoirs to the public, cunningly disguised as novels. 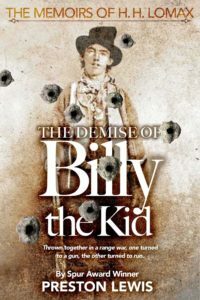 He has done it splendidly … The Demise of Billy the Kid is a wonderfully told tale of the rise, fall and death of the Kid as seen through the tough, intelligent, good-humored frontiersman, Henry Harrison Lomax of Arkansas. It takes a special talent to write first-person novels based on the premise of ‘lost papers,’ but Preston Lewis is an especially fresh and innovative writer and he knows how to do it. Lomax is a rowdy, bawdy, reluctant knight-errant whose close association with William ‘Billy the Kid’ Bonney nearly causes his death …Lovers of folkspeech will revel in Lewis’s use of grandiose similes … Lewis, an experienced writer of category or formula fiction as well as mainstream works, knows well the art of spinning out a story … (and) … becomes a humorist whose The Demise of Billy the Kid puts him in the company of Mark Twain and humorists of the Old Southwest.